Not since the unwelcome genesis of gurning feline lardbucket Big the Cat has the old Ronseal slogan ‘does what it says on the tin’ been so apt. Random the Dungeon is a dungeon, and it’s random. And I don’t mean in the sense that every fifteen year old of the last decade has claimed to be ‘random’ – that is, in the sense of being utterly predictable and generic (or, less old-gittishly, in the sense of Parodius-style contrived zaniness). I don’t even mean ‘random’ in the sense of Minecraft, Terraria or Lair of the Evildoer – generated within certain boundaries and adhering to general guidelines. I mean actually, genuinely random. It’s a very simple game; Atari 2600 simple. You control a little guy. He’s in a dungeon composed of a series of single-screen rooms. Each room has one entrance, one exit and one key. You can guess the rest (unless you’re one of the aforementioned oh-so-random teenagers, in which case you’re probably puzzled that the solution isn’t ‘put a llama in a bath full of carol-singing radishes and push it down a log flume into Norwich town hall’). The catch is that each of these rooms is carpeted with instantly deadly lava, and our little fella (stop giggling) can only reach the key and exit by jumping from block to block – and this is where the unpredictability comes in. The blocks are placed literally at random. More often than not, it’s actually impossible to reach either the key or the exit. There’s a 50/50 chance of not even being able to move away from the entrance. This was never going to end well. Time to press X. Again. This is the real downfall of Random the Dungeon. 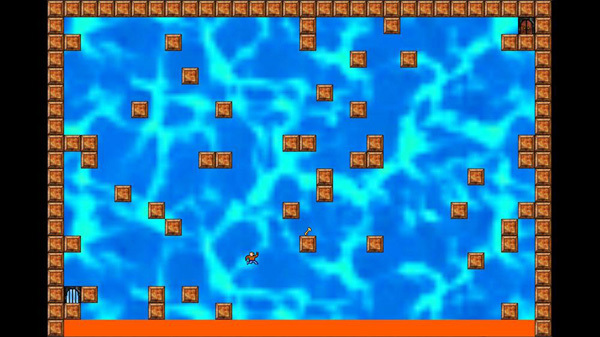 It can take a minute or two of patiently reshuffling over and over before the room takes on a layout that even looks like it might conceivably be possible, so when you miss a tricky jump and plunge to your temporary demise in the lava, causing the blocks to re-randomise again, despair begins to take hold. It’s not even frustrating; it’s just wearisome. Poor old Random the Dungeon. It could have found itself a little niche amongst those who fondly remember minimalist platformers like Miner 2049er and those with a fondness for quirky curios. In many ways it’s an elegant and pleasing idea to randomise each room, with optional reshuffling on demand. I can see why the developer thought it would work. Certainly it had enough promise for curiosity to pull me in, and I’m sure I’m not alone. But, just like true anarchy, Random the Dungeon takes things too far. There have to be some guidelines or the whole thing becomes unworkable. Maybe that’s Random the Dungeon‘s real function: to deliver a subtle socio-political statement in the guise of a piffling Xbox Live indie game. Or maybe it’s just a cautionary tale against letting indie developers do your interior decorating. This entry was posted in 80 Microsoft points, XBLIG reviews and tagged 360, game, games, indie, random, random the dungeon, review, xbla, xblig, xbox, xbox 360, xbox live.